This image shows 22 out of 150 supernovae, only 10% of the Subaru Deep Field. 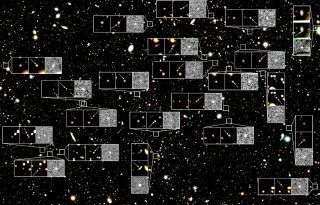 With the exception of a few nearby Milky Way stars, each point of light in the image is a galaxy, which consists of tens of billions of stars. Astronomers have peeled back layers of time to reveal a dozen of the most ancient star explosions ever seen, researchers announced today (Oct. 5). These explosions, called supernovas, helped seed the universe with chemical elements, and scientists are able to use them as mile markers to measure the cosmos. In all, the scientists observed 150 supernovas in this bit of sky, 12 of which occurred around 10 billion years ago, meaning they exploded when the universe was only 3.7 billion years old, about one-third its present age of 13.7 billion years. Some supernovas are the violent deaths of massive stars. When these stars have burned up all their fuel, they finally succumb to the inward pull of gravity and collapse to become dense remnants such as neutron stars and black holes. In the process, they expel copious amounts of energy in a short and powerful explosion that's so bright we can see it across the universe. Other supernovas occur when a special type of smaller star, called a white dwarf, slowly siphons off mass from a companion star, until it becomes too heavy and collapses in a similarly luminous detonation. This kind of supernova, called Type 1a, always occurs when the star has reached a particular mass threshold, called the Chandrasekhar limit, and therefore Type 1a supernovas always release the same amount of radiation. By comparing their apparent brightness on the sky with the brightness they would have if an observer were right next to them, astronomers can measure their distances. For this reason, Type 1a supernovas have become handy cosmic yardsticks that have helped astronomers realize that the expansion of the universe is accelerating, apparently due to a mysterious force called dark energy — a discovery that was awarded the 2011 Nobel Prize in physics. The new research revealed that Type 1a supernovas were about five times more common during this ancient epoch, 10 billion years ago, than they are today. As stars formed and carried out nuclear fusion in their cores, elements like carbon, nitrogen and oxygen were created. But to make anything heaver than iron, which has 26 protons per atom, would take a supernova. Only the extreme energies of these explosions are powerful enough to fuse these elements. Supernovas not only create these heavy elements but disperse them throughout space when they explode. Then the elements are caught up and made into new generations of stars, and eventually find their way into planets like Earth. "These elements are the atoms that form the ground we stand on, our bodies, and the iron in the blood that flows through our veins," astronomer Dan Maoz, one of the leaders of the new study, said in a statement. And without supernovas, none of this would be possible. By studying these ancient explosions, the scientists hope to learn more about the timeline of element creation in the universe. The research was led by Tel Aviv University astrophysicists Maoz, Dovi Poznanski and Or Graur, and included scientists from the University of Tokyo, Kyoto University, the University of California Berkeley, and Lawrence Berkeley National Laboratory. The findings are reported this month in the Monthly Notices of the Royal Astronomical Society.